visual energy has all it takes to successfully complete the energy efficiency mission: powerful functions, an intuitive interface and intelligent technologies. In energy data management, everything is based on the continuous and precise measurement and recording of you energy consumption. visual energy helps you measure data with 100 % accuracy. visual energy automatically checks your energy data for plausibility and reliably prevents mismatches between measured values and energy flows. With energy data management in visual energy, you can see your savings and optimization potential. 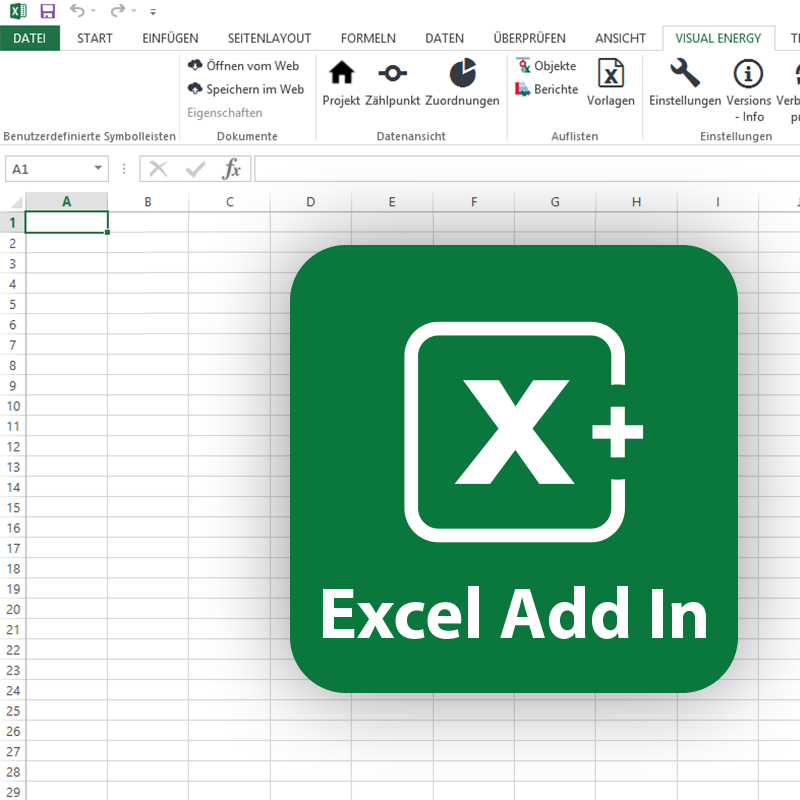 Use the integrated Excel add-in to get your energy data in PDF formal or as an Excel spreadsheet to process them further. In energy data management, everything is based on precise measurement and the continuous recording of your energy consumption. visual energy ensures 100 % accurate measured data and provides structured and correct visualization. Your energy data is automatically checked for plausibility upon recording. This reliably prevents mismatches between measured values and energy flows. With comfortable workflows and the integrated Excel add-in, you have additional tools for effective energy data management. visual energy comes with an Excel add-in to generate codes. It is easy to use and lets you generate an infinite number of unique codes. Production figures are recorded and saved in different systems. Most of them have an Excel interface. This allows you to generate the required codes without any error-prone detours. 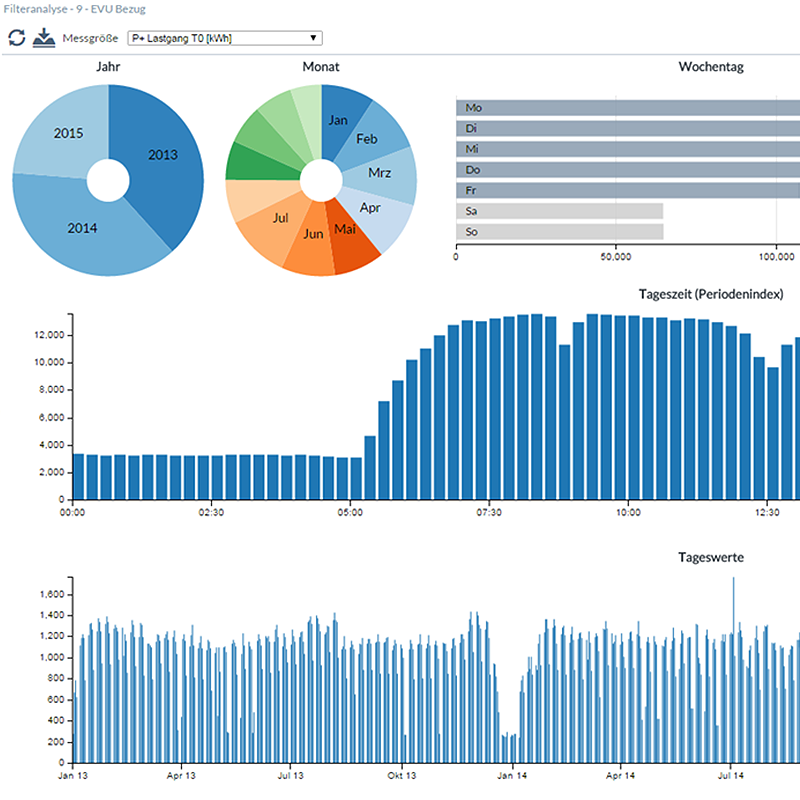 A big plus of energy data management with visual energy is working with workflows. Workflows are predefined standard actions for the most common applications or individually defined routines that help you control your processes quickly, reliably and without any errors. Many tasks and processes are completed almost automatically with minimum effort. Get a clear overview of all relevant information. Personalize how the data is displayed according to your requirements without needing any programming skills: a graphical plant overview with codes, informative load profile diagrams or consumption values for cost centers, for example. 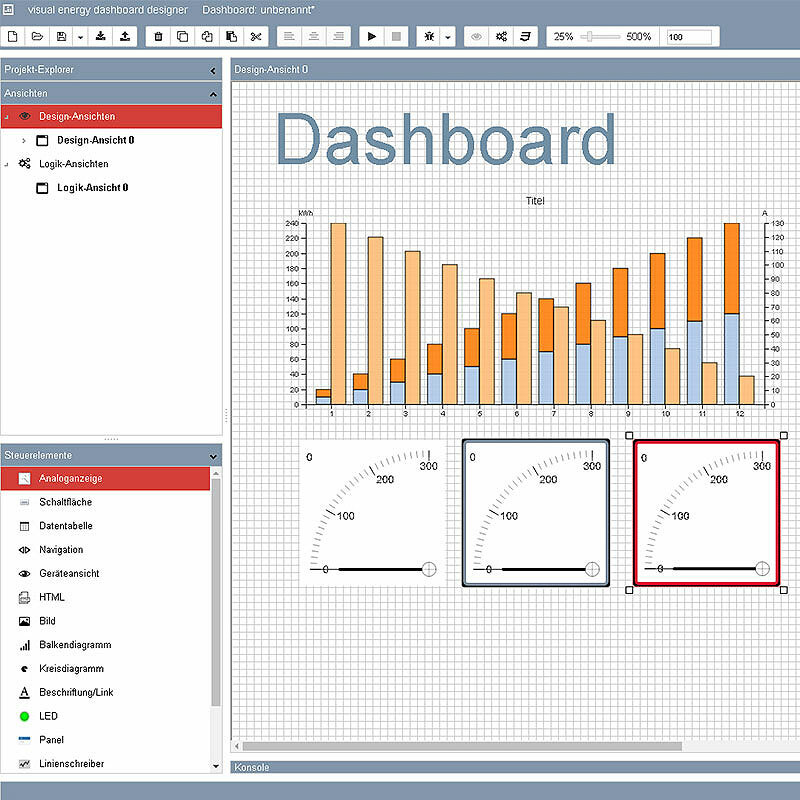 The dashboard designer provides you with all the tools you need to clearly visualize your facts and figures in no time. Once you have loaded your data into your diagram, you can use your level-time chart to make even the most complex evaluation without any delay. 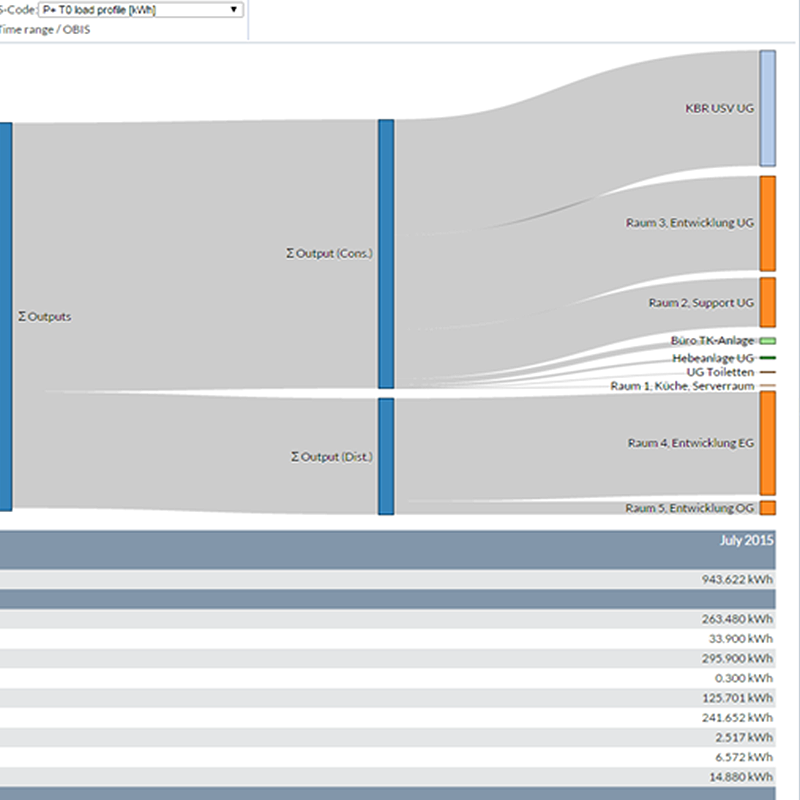 With only a few clicks, any consumption behavior, no matter how complex, can be visualized and analyzed. The defined values are loaded in the browser once and the result is visualized in real time every time you change the parameters. Long loading times are a thing of the past. Another highlight is the possibility to compare different media (e.g. outdoor temperature in relation to heating costs) in a diagram. You can customize your diagram design anytime, as a bar, line or area chart. You can also adapt the display colors as you like. To reduce energy consumption, the energy manager has to detect weaknesses in the energy consumption behavior and initiate improvements. This is possible with the visual energy filter analysis function. With only a few clicks, any consumption behavior, no matter how complex, can be visualized and analyzed: the company’s energy flows become transparent and you can optimize energy efficiency. This function highlights particularly noteworthy sections within evaluations, diagrams or reports. This way, you immediately see special tariff times, acute high-load windows, critical frost limits or standard-compliant voltage ranges. As a reaction to local residents complaining, a company’s noise emissions are to be recorded and documented. Sound level meters with analog outputs are installed in the outdoor area of the company. The outputs are connected to a multisio D2-4AI. The noise emissions are saved for evidence purposes using visual energy. If the maximum noise level is exceeded, the employee responsible is immediately notified by e-mail. Monitoring of fuses of the individual racks in a data center. In case of an imminent overload, a warning is to be issued. The currents in the racks are measured with a multisio D2-4CI. Additionally, the temperature in the data center is monitored with a multisio D2-4TI. At 80 % of the fuse current, a warning is sent to the employees in charge. The racks and the room can be seen online in visual energy. A red diode lights up if the defined warning thresholds are exceeded and the responsible employee is notified by e-mail. The equipment is to be maintained after a certain amount of operating hours instead of at a fixed date. Machine and plant control reports during operation. The signals are registered by a multisio D2-4DI. Then they are analyzed in visual energy to determine when maintenance is necessary. Optimum energy management is based on the fault-free evaluation of your measured energy data. Thanks to the automatic plausibility check, incorrect virtual measured data is a thing of the past. You can assign consumption measurements to cost centers and energy benefits by percentage (up to 100 %). With exact data analyses and visualizations, visual energy makes it easy for you to detect and exploit savings and optimization potential. Furthermore, automated workflows for standard actions or individually defined routines make your everyday working life easier. visual energy assigns a unique energy label in accordance with the BDEW metering code to every measured value. Explained using the example of electrical energy, this means that energy consumption values in kWh cannot always be added automatically (e.g. with cost centers, billing, etc.). Energy can be consumed or recovered. They have different directions and must not be added in any case. Furthermore, other energy types are also expressed in kWh (e.g. heat). To prevent wrong billing or balances, visual energy adds the valid OBIS code in accordance with the BDEW metering code to every measured value. This rules out unintentional user errors. In the KBR system, each individual measured value is transmitted with a status label (as required by the BDEW metering code). You immediately get the unambiguous information whether or not the measuring device has measured all values and transmitted them to the database. Workflows ensure user comfort and plausible data when working with visual energy. These automated routines are predefined for the most common standard actions and can be easily adapted to specific requirements. With data checked for plausibility, you can complete the most different tasks in a few clicks. The system detects any missing measured values and replaces them in accordance with the BDEW metering code. Your energy data is also completed with plausible substitute values in case of data loss. Of course, you can always enter manual changes as well. With simple predefined drawing objects, you can precisely map the structure of your supply network. Forgotten measurements, incorrect formulas or incorrect energy flow direction are a thing of the past thanks to balancing group calculation. You can capture your energy data by recording load profiles or meter readings. The advantage of load profile recording is that the devices’ energy consumption behavior is saved in the KBR measuring devices for 4 weeks. In case of an error (data cannot be retrieved), data loss is not a problem and you can rely on complete load profile data. Data security is our priority. Your measured data is not only saved on the individual devices, but also on the bus master. In visual energy’s SQL database, the data is then merged for long-term storage. This ensures that your data will not get lost in the event of disruptions. Plausible and reliable energy data is crucial for any energy technical process to increase quality, conserve valuable resources and create independence. visual energy features a series of important monitoring functions that help you maintain control of your energy costs at all times. A clearly structured rights management system, TÜV certification in accordance with ISO 50001 and early detection of overloads help you prevent production downtimes and eliminate any potential energy guzzlers. visual energy has been certified in accordance with the ISO 50001 standard and qualifies for subsidies granted by the BAFA (German Federal Office for Economic Affairs and Export Control). 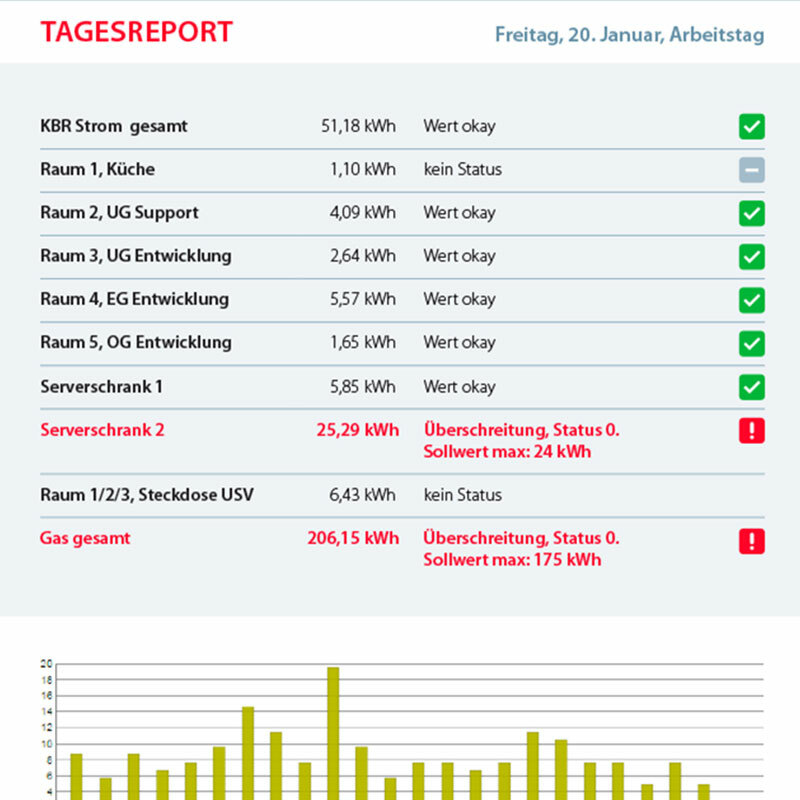 With the recertification, TÜV Süd (German Technical Inspection Association) confirmed visual energy’s high energy data consistency and plausibility, representing a unique selling point in the field of energy data management systems*. visual energy’s integrated consumption monitoring feature ensures that neither unrealistically high nor unrealistically low consumption values go unnoticed. The latter happens particularly often if manual readings are forgotten or if there is an interference in the measurement Operation. On request, we will monitor your system’s telemetry data. In this context, we do not only check the functionality of the devices used, but also any running Windows services. We can remedy errors with remote maintenance, making sure your energy data management system runs smoothly all the time, allowing you to concentrate on energy efficiency measures. visual energy does not only independently and continuously monitor the function of connected measuring devices, but also the connection of the individual bus segments. In case of a malfunction, you are immediately notified by e-mail. In combination with KBR eBus devices, visual energy guarantees continuous electrical fuse monitoring. The system can detect line, fuse, main switch and transformer overloads in the run-up to a potential disruption. As the user, you can define an individual threshold value for every measuring device. If this threshold is reached, the technical team is notified right away. This way, possible production downtimes caused by overload can be detected in advance. This increases operational safety. Blown fuses are also detected and reported right away. Naturally, the focus is on avoiding reactive current costs. Unfortunately, the network harmonics influence the existing compensation systems in a way that it is in most cases impossible to maintain the intended capacity. This can cause dangerous resonance effects. With the protected secureC concept, KBR and visual energy ensure security here, as well. Don’t leave anything to chance. Security and cost-effectiveness are central factors in companies. Technical infrastructure such as machines, production facilities or office equipment must work faultlessly. Together with class A KBR measuring devices and devices of the multiwave line, visual energy provides everything you need for excellent network quality. With visual energy, you can define the data arrangement that is best for your needs. Whether it be for your managing director, technical manager, energy manager or your employees, you can assign each user individual rights not only for specific locations, but also for individual mediums. For the administrator, only having to set up each user role once is a tremendous help. 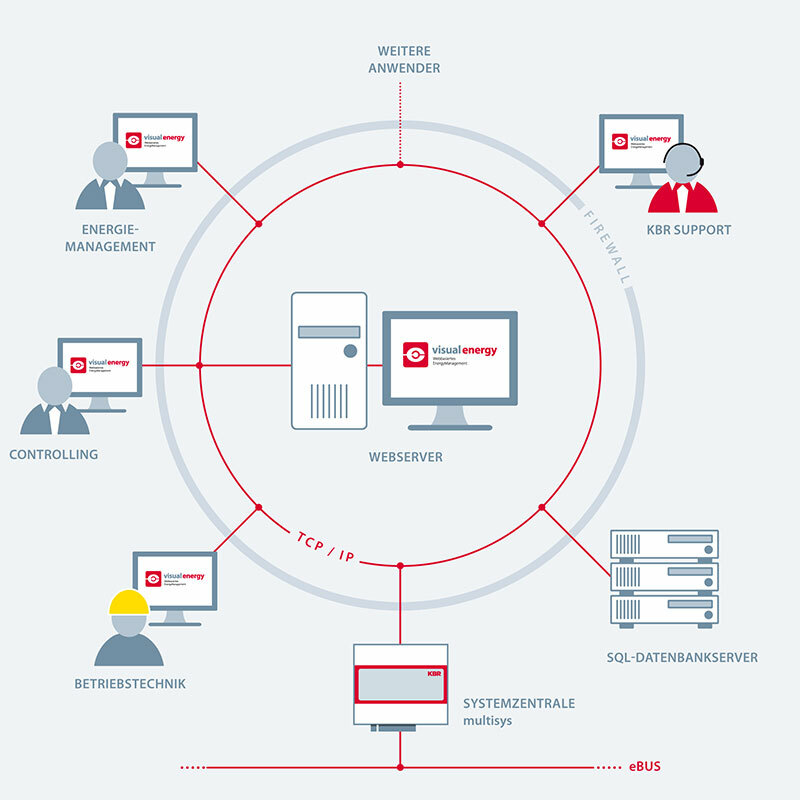 visual energy is available in a satnd-alone version, as all-in-one package or cloud solution. All versions are quick and easy to successfully integrate into your business processes. Another plus: each package can be scaled independently of the company size – for a small business as well as for a large group. You only want to buy the software and install it on your own servers? That is no problem at all: visual energy can also be integrated into existing systems as a stand-alone solution and also works with measuring devices of other manufacturers. A software and hardware package that leaves nothing to be desired. You get the most current version of the visual energy software including SQL and web server on a KBR 19-inch rack. On request, we also set up all relevant requirements for your project before delivering the hardware to you. If you do not want to take care of software updates and database maintenance, the cloud package is perfect for you. Data backup included. Fast and secure server connections let you work with the highest possible flexibility from day 1. You don’t know which package to choose for your company? Contact us! We will provide you with competent advice.